Not long ago, hydraulics consultant Jeff Freeman traveled to a remote area of Panama to renovate the circulation and filtration system on a big pool at a missionary camp that serves its region’s underprivileged children. The situation he encountered is a textbook case in just how bad things can get when hydraulics are not well considered before construction – and how much they can be improved through application of some common sense. It’s truly a diamond in the rough: a huge, sparkling blue pool set in the middle of nowhere in a country that is probably best known for being the gateway between two grand oceans. 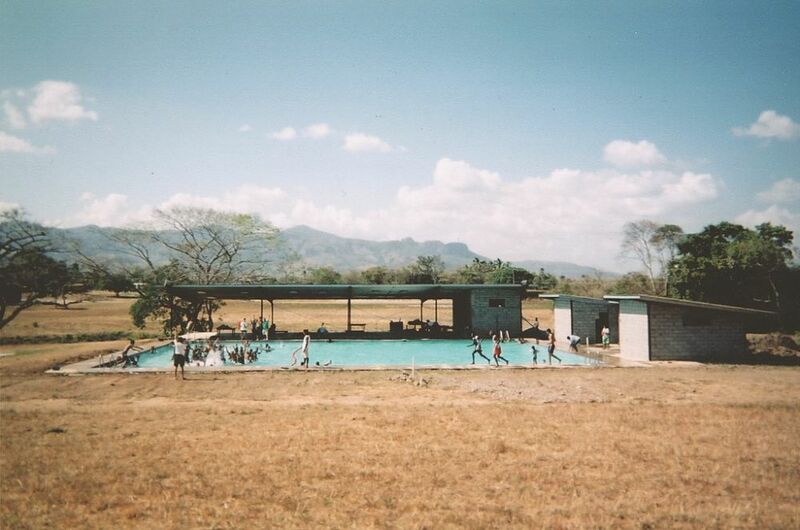 For a time before I arrived on the scene, however, the enormous rectangular swimming pool at Palabra de Vida, a Christian missionary camp in Chame, Panama, was anything but shimmering. The mission operates a camp for the region’s underprivileged children, who visit the facility in shifts that stretch across several months each year. There are times when the camp is quiet and almost empty, and others when it is a beehive of activity. 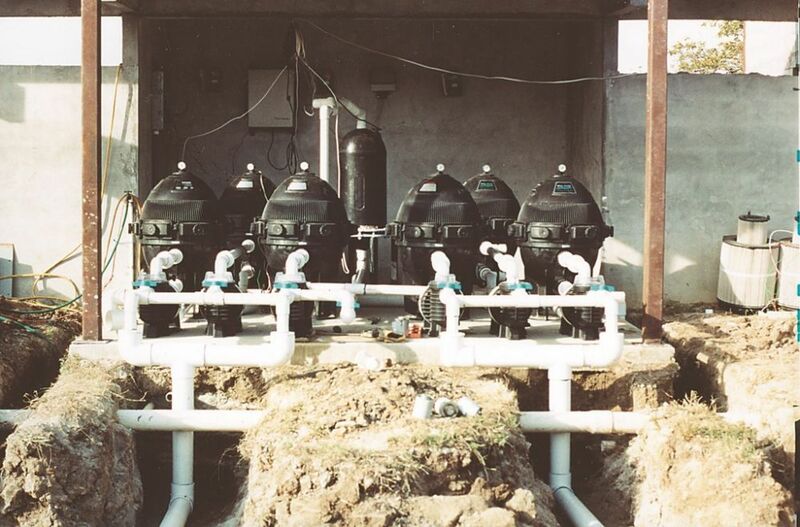 Last year, the facility’s staff ordered a water-treatment system for the pool, and, in my role as technical sales manager for Eco-Matic Systems of Newport Beach, Calif., I was asked to travel to the site and install a new chlorine generator. Upon arrival, I discovered a plumbing, pumping and filtration system that was totally inadequate to the purpose. Water quality was dreadful, power consumption was astronomical and maintenance was a nightmare. Passionate about proper hydraulics and hating to see any pool function so poorly, I volunteered to donate my services and oversee a complete renovation of the system. The good people at the mission took me up on my offer, and here’s what happened. The terrain surrounding the 62-acre facility is stunning, a broad veldt bordered by towering coastal mountains on the Pacific side of the isthmus. The area immediately surrounding the camp resembles the African savanna – cattle ranches and pasturelands interspersed by swaths of teak forest as the land rises to the mountains in the distance. The pool itself is as big as those great outdoors: It measures 65 by 82 feet, ranges from 3-1/2 to 7 feet deep, and holds about 220,000 gallons. The construction is unusual, featuring a poured-concrete floor and block walls filled solid with concrete and scratch-coated with plaster. In fact, the only good thing about the three-year-old pool (besides its setting) was the shell, which had been designed by a structural engineer in Panama City. Widely believed to be the largest swimming pool in the whole country, the vessel only cost $50,000 to build, which, I suppose, only confirms the adage, “You get what you pay for.” The pumps were too big, the filters were too small and the plumbing was far too small. And it had just six skimmers, all poorly placed. Before I returned for my second visit, the trench just beyond the deck had been dug – but that still left us with the task of burrowing beneath the deck to reach the shell and address the needs of the plumbing – and of cutting away sections of the deck to set up the new skimmers. To put the inadequacies in perspective, commercial pools in the United States are generally required to have a skimmer for every 500 square feet of surface area. In this case, this means that the pool should have had 11 skimmers, not six. Not to overstate the case, but it’s safe to say that whoever installed this system made just about every major mistake that could be made with respect to hydraulics. As a result, the pool was cursed with awful water quality, radically inefficient energy use and a maintenance situation that defied belief. On warm busy days, for instance, with 200 to 300 kids in the pool at a time all day long, the camp staff would clean the three 72-square-foot, non-backwashing D.E. filters three times each day! To complete the picture of this little pool of horrors, the plumbing system featured 18 return lines, all wall-mounted, and three main drains, each of which had its own line back to the equipment pad. Basically, it had been configured as three separate systems (there are no split-suction safety concerns in this country), with a three-horsepower pump feeding each filter and with two skimmers and six returns per pump. Even though this is an extreme situation in an exotic setting, the systems issues presented by this Panamanian pool offer a remarkably simple case study in hydraulic design for swimming pools. What we had here was a pump that wanted to move an absolute, bare minimum of 150 gallons per minute and that was trying to do so through a single 2-inch line from the main drain and two 1-1/2-inch lines from the skimmers. Some of the runs spanned more than 100 feet, so just imagine what the resistance (or feet of head) in those lines must have been! Consider as well that each pump was driving a filter that, at the far end of its maximum operating range, can only handle 144 gpm. Those pumps were screaming with cavitation, and there was so much pressure inside the filters that the grids were being crushed. In turn, the excessive pressure reduced the filtration area and thus each filter’s cleaning capacity, aggravating the situation dramatically. In fact, the staff was replacing entire grid sets every three months, and conditions in the pool kept getting worse. When everything was working (which wasn’t often the case), the optimum turnover rate was something like once in 18 hours. When I installed the chlorine generator, my rough calculations showed a 23-hour turnover – not good! 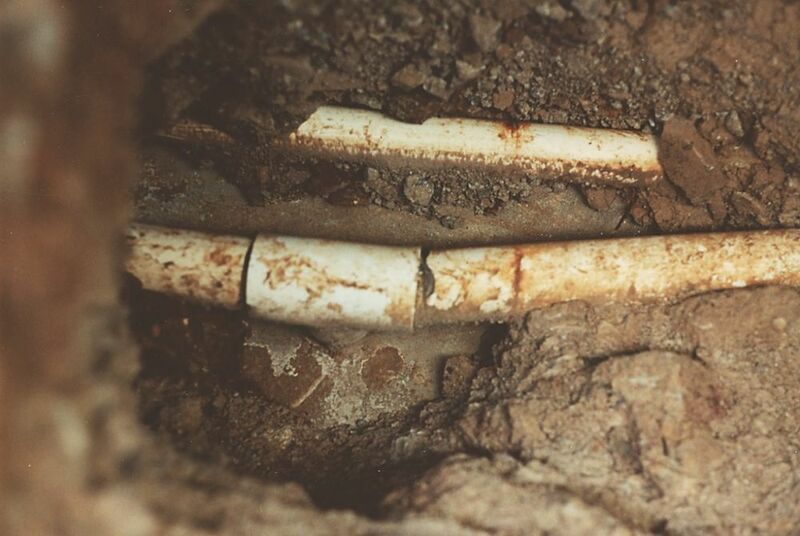 We found some fairly horrific problems when we unearthed the plumbing, including connections battered enough by the heaving of the clay soil to account for the fact that the pool was losing thousands of gallons per day. To be sure, the soils problem was compounded by improper backfilling of the original construction trenches. Furthermore, the original builder failed to consider wind direction in laying out the skimmers. As luck would have it, there was no skimmer at all in the one corner of the pool to which the prevailing winds normally pushed debris. The result: A pocket of debris the size of a large residential pool would form in that corner almost every day. 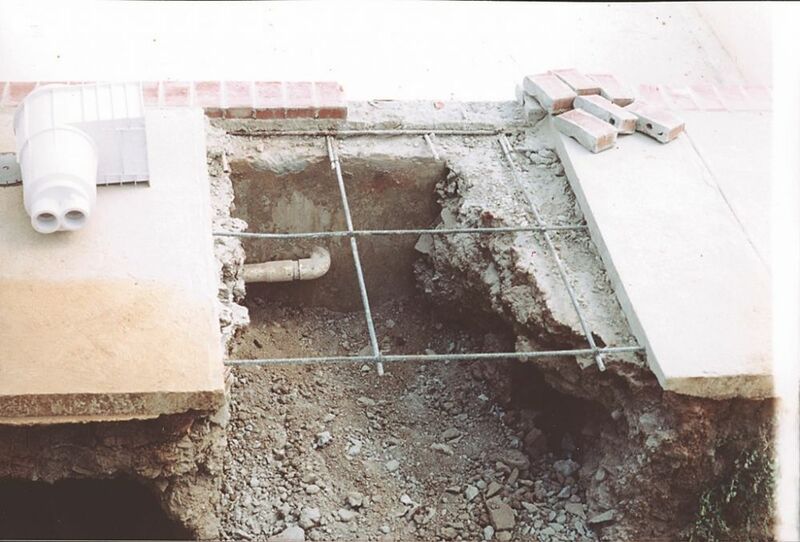 In addition, the pool was installed in clay soil without suitable techniques. 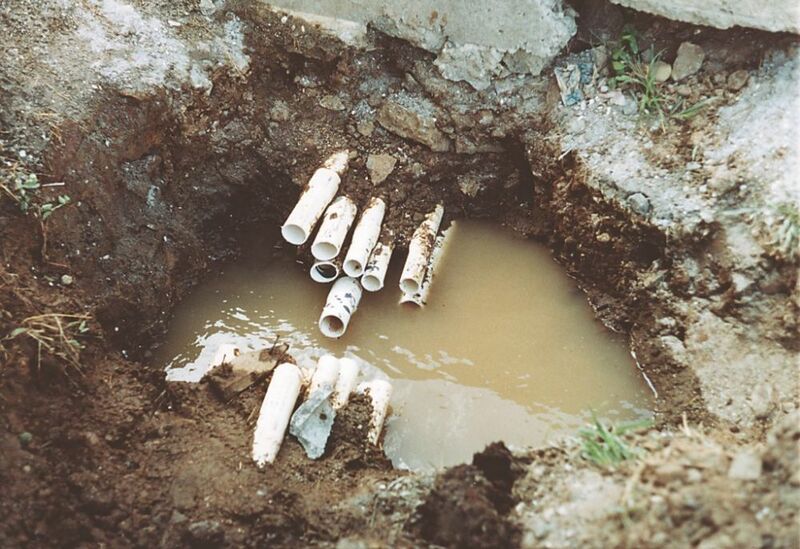 Indeed, the plumbing lines had all been buried in haphazard clusters in ditches that had been backfilled with chunks of clay – no sand, no attempts at compaction. And this is a place where it’s generally bone-dry about six months each year and experiences rainfall of 160 inches or more through the other six months. So after they built the pool (presumably during the dry season), the rains came and all of that loose-clay backfilling material was compacted by Mother Nature – and had the effect of crushing, shearing and otherwise destroying much of the underlying plumbing. So pipes were bowed, pulled out of fittings or snapped. After just a few years, the system was already losing about 1,000 gallons per day. The situation became so bad that they gave up and drained the pool about two months before I made my second visit to the camp. But let me back up a bit: During my first site visit, I made a series of quick measurements and calculations, sat down with the staff and told them what could be done. They immediately asked me to come back and oversee the renovation, promising to assemble a work force and make all the requisite equipment and material purchases in advance of my return. When I came home to California, the first thing I did was employ the “keep it simple” concept – something I apply whenever possible in my hydraulic designs. In this case, I wanted to simplify the system to ease maintenance and increase reliability. So I did the calculations that should have been done in the first place, starting with determinations of the pool’s capacity, a projected bather load and a target turnover rate. I thought about skimmers (number and placement) and the plumbing configuration and, ultimately, developed a game plan for the construction project. At the heart of all of this, I wanted to simplify the hydraulics by using big pipes, big filters and dramatically downsized pumps. I acquired the equipment on behalf of the mission from Ontario, Calif.-based Pool Electric Products, which handled the shipping for me. The pumps and filters were from Sta-Rite Industries (Delavan, Wis.) and consisted of Max-e-Glas II pumps and System 3 modular-media cartridge filters. 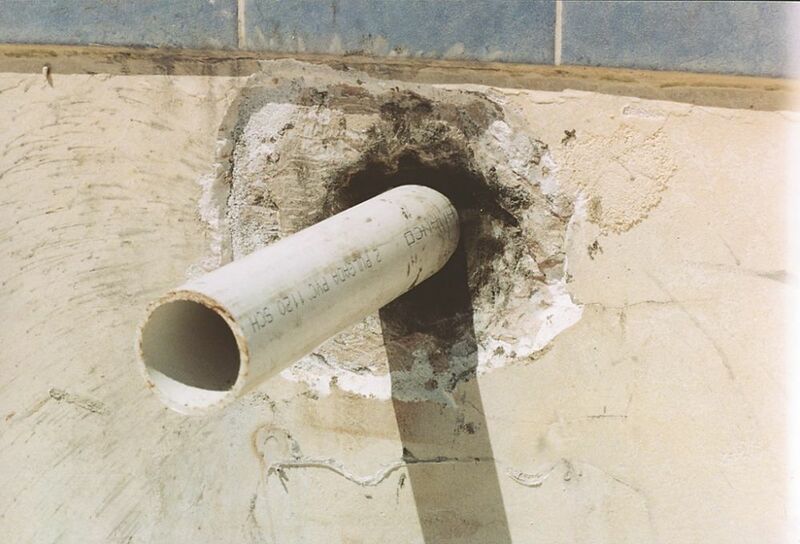 We made good use of a core drill we found among the mission’s store of tools and set new suction and return lines all the way around the pool. All those lines, properly sized and looped, ultimately ran back to a thoroughly remodeled equipment pad. I chose cartridge filters for two reasons: First, diatomaceous earth is hard to come by in Panama; second, cartridges offer greater filter area in smaller relative spaces. In changing the filters, in fact, we went from 216 total square feet of filter area in the three D.E. filters to 1,800 square feet with the six modular units. The new plumbing is Schedule 40 PVC, with 4-inch, looped suction and return manifolds surrounding the pool, stepped down to 2-inch branches to the returns and in lines coming from the skimmers and drains. I knew I could acquire the pipe in Panama, but the fittings – as I had learned on my first trip – would be another story. Not wanting to be caught short, I had shipped an ample supply of fittings through a distributor in Florida. Plans in hand, I was less concerned about the hydraulics than I was about the logistics of working in such a remote location. I had no idea what the workforce would be like with respect to skill level, and there were huge questions about what we’d run into once we started digging. To set things up before my arrival, I’d asked the camp’s staff to backhoe a full-perimeter trench just beyond the five-foot band of decking that surrounded the vessel – and also to trench back to the equipment area. By the time I landed in Panama, all of the equipment had been delivered along with 400 feet of 2-inch pipe, 920 feet of 4-inch pipe and a multitude of fittings. In all, I personally set 475 glue joints; why I kept track of that number, I’m not really sure – other than to remind myself that the project involved lots of hands-on labor in the trenches for all of us. [ ] Small pumps are inexpensive. [ ] If one pump fails, you lose less of your pumping capacity while a replacement is obtained. [ ] Replacement parts for small units are far less expensive and are more readily available than are those for large pumps. Also, by using multiple pumps, you’re running water through more hair-and-lint traps, which are typically six inches in diameter regardless of pump size (up to a point, anyway). By using multiple pumps, you essentially increase the space that the water flows through in entering the pumps, which, is the same as running larger volumes of water through larger pipe and, in turn, increasing water flow through the system. Multiple pumps also increase energy efficiency because you can get greater volumes of water through multiple traps. One 3-hp pump, for example, can produce a flow of 150 gpm if plumbed properly. One 3/4-hp pump can produce a flow of up to 75 gpm. In other words, the two smaller pumps produce a 150-gpm flow rate while consuming just 1.5-hp of energy. Finally, when plumbing multiple-pump systems such as the one described in the accompanying text, I always opt for looped manifolds from which I branch off to the individual pump connections. In this case, there are two manifolds, and the fact that both are looped makes for more balanced flow and even pressures throughout they system. The crew included six Americans from Racine, Wis. – part of a missionary group on hand to work on the dormitory buildings – and six Panamanians. Everyone was extremely helpful, and I’ve never seen a more positive work ethic anywhere: It had all the spirit and atmosphere of a community barn-raising. In all, we dug 15 burrows to the return lines, five to skimmers and three more where we cut into the deck for placement of new skimmers. We also pressure-tested the 2-inch main drain plumbing. I would have preferred up-sizing these drain lines, but they proved to be sound and would have to do: Replacing them would have been a huge undertaking even in better working conditions. In three places, return lines had been so thoroughly pinched and broken that clean removal and replacement wasn’t an option. We were fortunate to find a core drill we could use to punch through the shell to set up new lines. We set the 4-inch plumbing into the trenches and stepped it down to all of the 2-inch return lines, forming a classic return loop – and did exactly the same with the suction loop and the requisite branches to the skimmers and drains. To compact the new trench, we repeatedly filled the space with water, allowing it to settle. 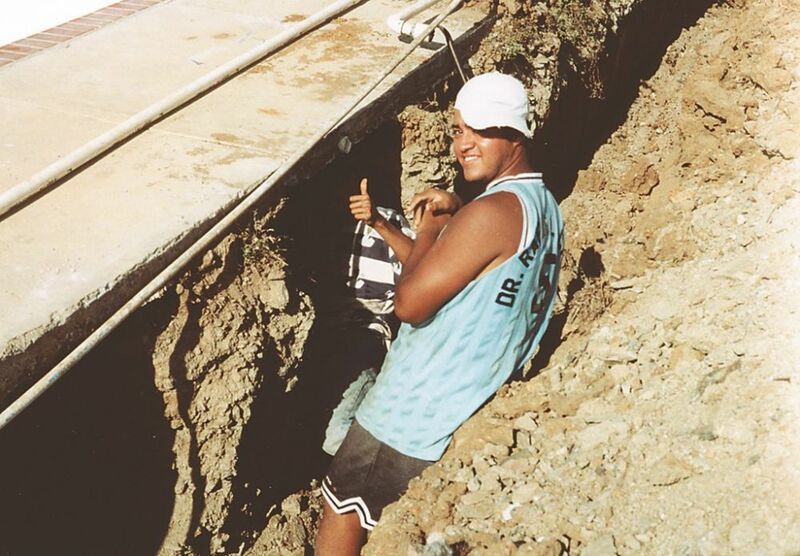 When the clay finally stopped settling, we had about four inches of freeboard beneath the plumbing lines and backfilled the space with sand. (The local sand consists mostly of crushed seashells, excellent for drainage around our plumbing runs.) Atop the sand, we finished the backfilling with about a foot of topsoil. With all the heavy work done, it was largely a mater of mopping up and fine-tuning things back at the equipment pad. One key upgrade involved setting up valves in irrigation boxes that let the staff shut off the skimmers to create more suction for vacuuming. The new skimmers are all SP 1070 dual-port units made by Hayward (Elizabeth, N.J.). In everything we did, we were fortunate that the camp had a well-equipped tool room. It seems that, through the years, dozens of missionaries have come to the site, donated their labor to building camp facilities and left their tools behind. So we were able to find, for example, all the diamond blades we needed to notch the pool walls for the new skimmers. We also discovered a general store about 30 minutes away that sold everything from tractor tires to fingernail polish. There’s a certain delight in properly setting up an equipment pad that reflects proper hydraulic thinking – one that will, in the case of a renovation such as this one, take an inefficient, inadequate and wasteful mess and turn it into system that literally purrs by comparison. In all, the project took just five days from start to finish. A couple of those ran full 24-hour cycles with us on site, but the crew stuck with me every step of the way. 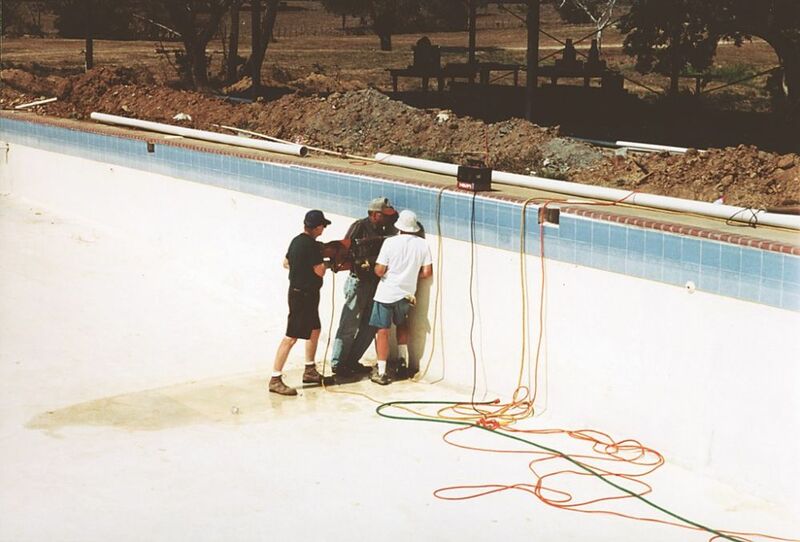 We started filling the pool two days before I left, and I was on my way home before the staff added the 7,000 pounds of salt needed by the chlorine-generating system. It was one of the most exhausting (yet invigorating) working weeks of my entire life. I haven’t been back yet to see how things are going, but I’ve been told over and over again that the water is crystal clear, the pumps are purring and the power consumption is, indeed, just a fraction of what it once had been. Knowing that the missionaries of Palabra de Vida (and, more important, their “clients”) are enjoying a pool that is finally functioning as it should is certainly satisfaction enough for me – but I must say that I’m looking forward to my next trip to Panama, when it’s time for a big replastering job. Jeff Freeman is director of commercial sales and technical director for Eco-matic, a manufacturer of chlorine generating systems based in Newport Beach, Calif., and is also founder of Fluid Logic, an independent hydraulics-consulting firm in Upland, Calif., that specializes in complex aquatic systems. He entered the watershaping industry more than 20 years ago, working for a wholesale distribution firm. He later established his own service and repair company, then returned to the distribution business as a product representative working with swimming pool and spa builders. He has extensive experience designing and troubleshooting hydraulic systems and has taught the subject at the California Polytechnical University in Pomona, Calif.